Tony presents a lecture on the out of bounds planet cycles in 2020 for this virtual summit. Tony presents a lecture for the annual NORWAC astrology conference in Seattle, WA. Join Kelly Surtees and Tony Howard for a special desert retreat that will help you make the most of 2019. You'll learn how to use progressions and transits to understand and align with the powerful energies unfolding in this momentous year. And you'll leave with practical tools for working with these planetary processes in your own chart. Tony will lead morning meditations, and guided processes for increasing reslience based on Rick Hanson's work with psychology and neuroscience. Tony is the host of a virtual summit featuring 14 astrologers over two days. Tony presents a lecture "5 Tips for Saturn Mastery". Tony is the host of a virtual summit featuring 13 astrologers over two days. Tony presents a lecture "How the Greater Malefics Can Be Your Greatest Assets" and created the bonus content "Your Mars Retrograde Survival Guide". We'll explore the seldom-used technique of declination to learn how the out of bounds signature alters our understanding of Mercury, Venus and Mars. Each of these planets can be "out of bounds," meaning that their declination is greater than that set by the Sun. Metaphorically, these planets operate "outside the Sun's jurisdiction." Many eye-opening chart examples will demonstrate how the out of bounds signature can dramatically enhance basic delineation. In this lively discussion, Tony explores the little-used technique of declination to learn how the out of bounds signature alters our understanding of Mercury, Venus and Mars. Each of these planets can be “out of bounds,” which means they have a declination that is beyond that set by the Sun. Out of bounds planets operate beyond the Sun’s jurisdiction, thus coloring their behavior. We’ll use many eye-opening chart examples to modify our understanding of a planet’s behavior using this powerful easy-to-use technique. In this lecture, you'll discover a powerful and easy way to incorporate declination into your chart analysis as we explore the always engaging topic of out of bounds planets. We'll focus here on the inner planets - Mercury, Venus and Mars, with a series of dynamic chart examples that will show you just how dramatically the out of bounds signature can modify the behavior of a planet. Out of bounds planets operate beyond the Sun’s jurisdiction, thus coloring their behavior. Metaphors like "outside the box" and "coloring outside the lines" work well to begin to understand this planetary signature, but that's just scratching the surface. Out of bounds stories are dramatic and engaging, so come on out and enjoy a fun lecture about a subject that promises to get you excited about this overlooked technique. In this workshop we'll expand on the morning lecture, delving much deeper into the many ways out of bounds planets can express in the birth chart. When an inner planet is out of bounds, it can express in a multitude of ways that we can only get a real sense of by looking at several charts. We'll look at many of these qualities of expression in detail, with a focus on the high and the low potentials inherent in each. You'll discover why Venus out of bounds folks can have a hard time setting limits, see examples of Mars out of bounds folks "going rogue," and why Mercury out of bounds people can so easily give preference to their head over their heart. The afternoon will be filled with chart examples and stories. Bring your own charts. We'll have plenty of time to find out if you have an out of bounds planet, and share your own out of bounds stories if you'd like. 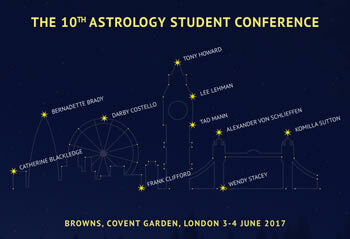 Tony will present a lecture on Mars for the 2017 Astrology Student Conference. Mars is often equated with anger and aggression, but there’s a great deal more to the planet of drive and initiative. In this talk, Tony will challenge typical portrayals of the red planet, consider when it is "out of bounds" and in aspect to Saturn or Neptune, and suggest ways of working with these complex energies so that we may feel more decisive and empowered. Download brochure. In this evening lecture for the San Francisco Astrological Society, Tony explores the little-used technique of declination to learn how the out of bounds signature alters our understanding of Mercury, Venus and Mars. Each of these planets can be “out of bounds,” which means they have a declination that is beyond that set by the Sun. Out of bounds planets operate beyond the Sun’s jurisdiction, thus coloring their behavior. We’ll use many eye-opening chart examples to modify our understanding of a planet’s behavior using this powerful easy-to-use technique. In this afternoon lecture for the Sacramento NCGR chapter, Tony explores the little-used technique of declination to learn how the out of bounds signature alters our understanding of Mercury, Venus and Mars. Each of these planets can be “out of bounds,” which means they have a declination that is beyond that set by the Sun. Out of bounds planets operate beyond the Sun’s jurisdiction, thus coloring their behavior. We’ll use many eye-opening chart examples to modify our understanding of a planet’s behavior using this powerful easy-to-use technique. Tony will present a lecture for the 2016 ISAR conference introducing "out of bounds" planets. We'll look at several fun chart examples to discover some of the ways the out of bounds signature expresses. Join Tony in Denver Colorado for a timely lecture on Saturn-Neptune aspects. In June 2016 we'll have the second of three exact squares between Saturn and Neptune. This talk will focus mainly on people born with natal Saturn-Neptune aspects, but the information will be very useful for those experiencing the current transiting square by aspect. We'll look at Saturn-Neptune from many facets by using several key birth charts so that you'll leave armed with ways to engage this energy in constructive ways.